Dazhi is a flat area between the northern bank of the Keelung River and the southern hills of the Ji-nan Mountain. Dazhi is split into two sections by the Bei-an Road. One side has new, high-profile developments, while the other half retains much of the old communities, along with several venerable institutions and organizations, such as the Shih-Chien University and the Navy Command Headquarters. Pronounced disconnections exist between the old and the new areas of Dazhi. The old district is denser, with a hundred-year old history, has retained human scale urban fabric that facilitates walking. While the new area has an image of prestige, it lacks the cohesive fabric to create community. Furthermore, the reclamation of the land from the Keelung River, has created a disjunction between the constructed settlement and the river which used to be integral to the site. 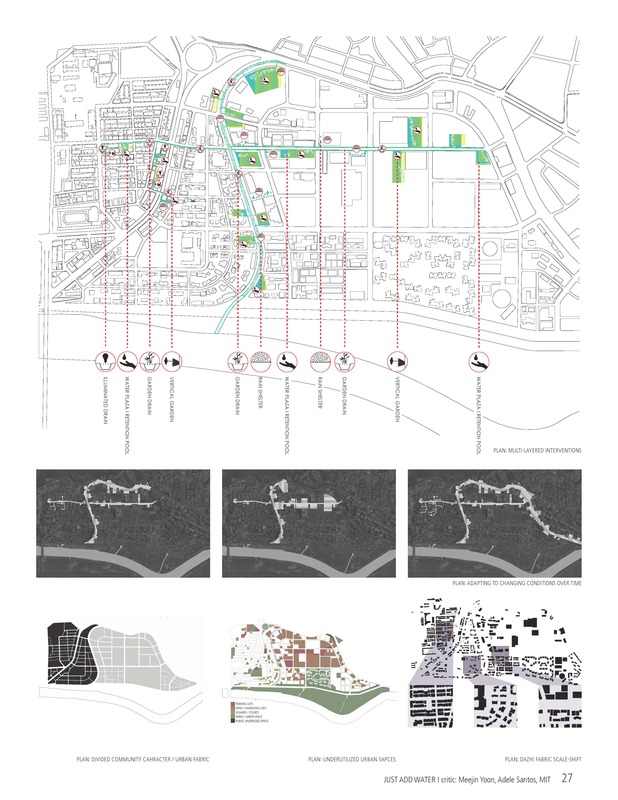 The project seeks to engage a dialogue between these two discrete areas through the element of water as a creative way to activate Dazhi’s public spaces. 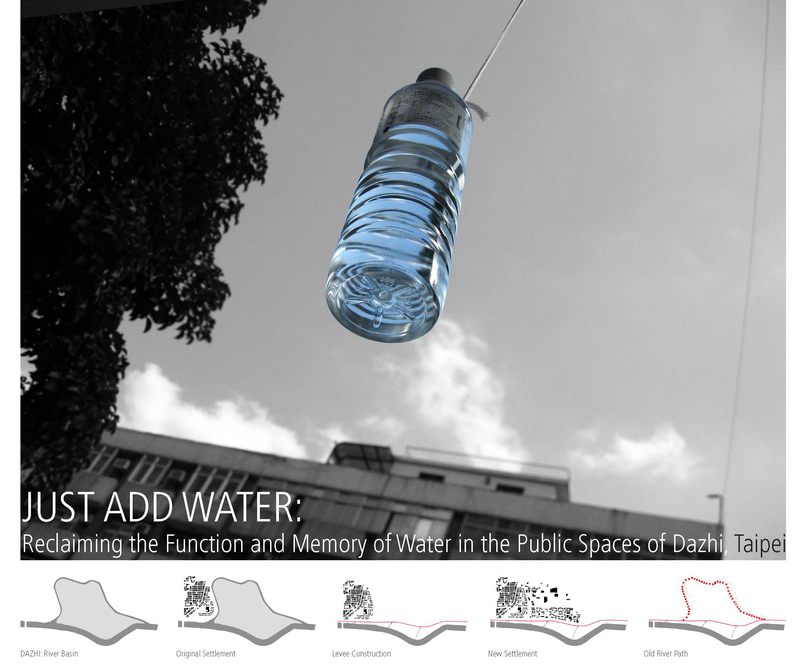 Water, then, emerges as the agent of communication between geographically disparate fragments of the built environment, as well as through time in order to reclaim the former integral relationship between people and their natural environment. 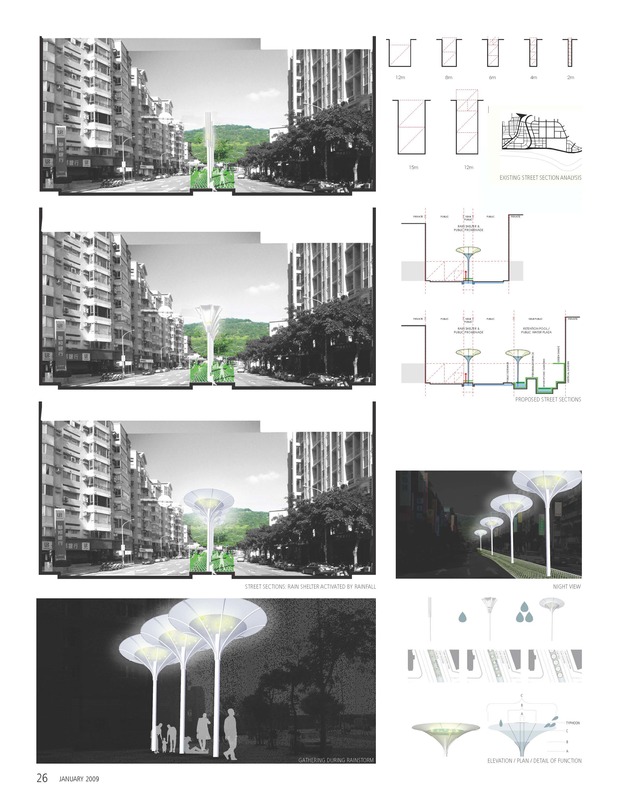 Water, passing through the ubiquitous yet largely hidden drains and catchment basins throughout the area, are brought to light and celebrated in the project addresses each stage of the water cycle: rain protection, water collection, retention and drainage. These rain shelters celebrate water, collect it for functional use, retain it to help the overwhelmed drainage system during typhoon season, provide public gathering spaces create by the water and are located along the former spine of the river that was truncated during the area’s industrial development of land reclamation.